On Thursday, May 9, two weeks after Earth Day, on the same day as the eclipse pictured, we hit 400ppm of CO2 in the atmosphere. According Pieter Tans of the National Oceanic and Atmospheric Administration as reported to AP, the last time we hit 400ppm was 2 million years ago, during the Pleistocene Era when “It was much warmer than it is today.” Back then, forests grew in Greenland, converting the carbon in the air into trees, and sea level was 33 to 66 feet higher than it is today. Other scientists say it may have been as long ago as 10 million years that we had this much carbon dioxide in the atmosphere. And modern humans have only been around for 100,000 years. In 1958, it was 315ppm. Before the Industrial Revolution, it was 280ppm, and following the Ice Age, it was 200ppm. These days, we are adding 2 ppm PER YEAR. It should mean a lot. Co2 triggers temperatures to rise over time, scientists say, which is causing sea levels to rise and some weather patterns to change. Think increased rain in the parts of the world that doesn’t need it, droughts in other parts of the world that do. More devastating forest fires. More floods. Crop losses. Starvation. Think loss of habitat for all species on the planet. We’re not just talking about polar bears dying, but huge loses of life to all species. Many species will go extinct. Our species may survive, but how many people will die first? “What we see today is 100 percent due to human activity,” said Tans, a NOAA senior scientist. We are slowly but surely disposing of our planet. In my opinion, our planet is NOT disposable. 400ppm should mean you do everything in your power to change your carbon footprint, and that of your family, friends, and neighbors. It should mean that you help change our government’s policies to those that are more sustainable to our life on this planet. What it means to me in this morning is, after I hit publish on this post, I’m going to help our planet by planting more vegetables in our very small garden. And…This fall, I’m going to make this issue a cornerstone of the classes that I teach by creating a climate of caring for each other and our planet inside and outside of the classroom. “We are at a point in the evolution of consciousness and the history of human-kind where we must begin to integrate the collective shadow of humanity—or it will destroy all human life on Earth. Our personal and collective shadows can turn anything into a weapon of mass destruction. Can we recognize that each of carries a destructive shadow that needs to be integrated? The process of integrating both the personal and the collective shadow is essential if there is to be a next stage in the development of collective human consciousness. Nouriani, S. (2011). The defensive misappropriation and corruption of cultural symbols. Jung Journal, 5(1), 19-30. MWV Observatory, Coca-Cola Space Science Center, Columbus State University Eclipse Team Explanation: This week the shadow of the New Moon fell on planet Earth, crossing Queensland’s Cape York in northern Australia … for the second time in six months. 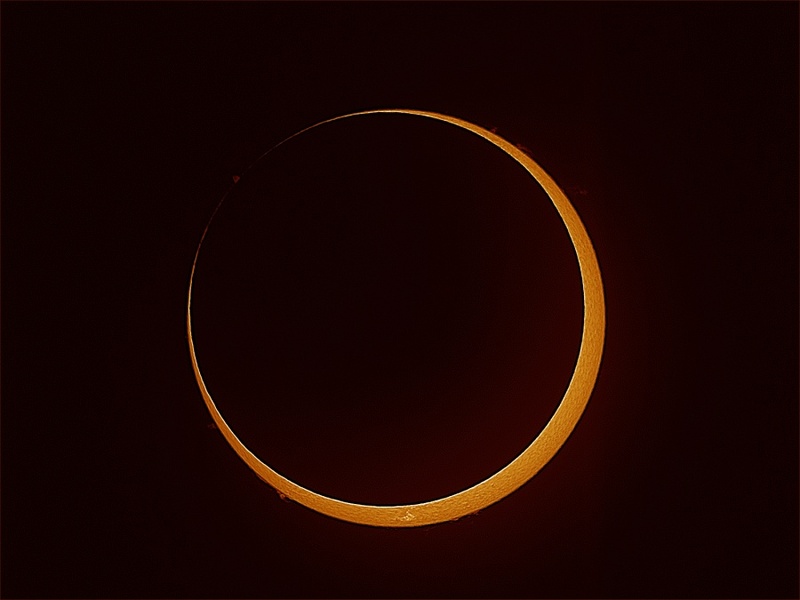 On the morning of May 10, the Moon’s apparent size was too small to completely cover the Sun though, revealing a “ring of fire” along the central path of the annular solar eclipse. Near mid-eclipse from Coen, Australia, a webcast team captured this telescopic snapshot of the annular phase. Taken with a hydrogen-alpha filter, the dramatic image finds the Moon’s silhouette just within the solar disk, and the limb of the active Sun spiked with solar prominences. Reblogged this on Compassionate Rebel. Thank you for sending this out to your women contacts and asking them to contribute their thoughts on what it means to have access to safe, legal abortion.